HOLYOKE, Mass. (May 2, 2014) – The Volleyball Hall of Fame announced today the names of six volleyball legends who will be inducted as the Class of 2014 into its hallowed halls on Oct. 18 in Holyoke, Mass., the sport’s birthplace. The 29th induction class consists of female indoor volleyball players Tara Cross-Battle of the United States and Roza Salikhova of the former USSR, male indoor volleyball player Nalbert Bitencourt of Brazil, female beach volleyball great Sandra Pires of Brazil, indoor coach Joop Alberda of the Netherlands and leader Miloslav Ejem of Czech Republic. The induction class is elected via a vote of current Volleyball Hall of Fame inductees. A total of 21 different countries are represented in the Volleyball Hall of Fame with at least one inductee. All told, 121 individuals will have been inducted into the Volleyball Hall of Fame after this year’s enshrinement ceremony. The Volleyball Hall of Fame induction festivities include a Mayor’s reception on Friday, Oct. 17, at Wistariahurst Museum in Holyoke, followed by the Ring and Plaque Ceremony inside the Volleyball Hall of Fame from noon to 1:30 p.m. ET on Saturday, Oct. 18, with the formal Enshrinement Dinner and Ceremony taking place the evening of Oct. 18. The Volleyball Hall of Fame, incorporated in 1978, continues to create a more representative institution with inductees of both genders and disciplines – indoor volleyball and beach volleyball – coming from a wide range of countries. For additional information on attending the 2014 Volleyball Hall of Fame induction ceremony, contact the Volleyball Hall of Fame at info@volleyhall.org or visit the Hall’s website at VolleyHall.org. 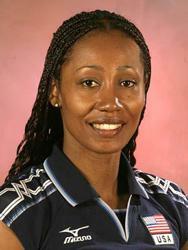 Tara Cross-Battle became the United States’ first four-time Olympic Games volleyball player having competed in the Games in 1992, 1996, 2000 and 2004. In her debut Olympics, she helped the United States to the bronze medal in Barcelona. Cross-Battle competed in three FIVB World Championships (1990, 1994, 2002), winning the bronze medal in 1990 and the silver medal in 2002. She was instrumental in the United States winning gold medals in the 1995 and 2001 FIVB World Grand Prix, along with bronze medals in the 2003 FIVB World Cup and World Grand Prix. In 2001, Cross-Battle led the U.S. to the NORCECA Continental Championship and was named most valuable player in the tournament.